It was Friday night and my son called. “Mom, do you have the skewers to roast marshmallows”? Let me tell you about my family and one of our family traditions. My son, in his thirties, married and 3 children, remembers when he and his sister were in elementary and middle school, we would roast marshmallows in the fireplace. We had special skewers we used for our roasting. My son wanted to use these with his family for their first marshmallow roast in their new home. Back to the request! In the kitchen, in the barbeque spot, were the roasting skewers. He came, took the skewers to their new home, and their family continued our family tradition. 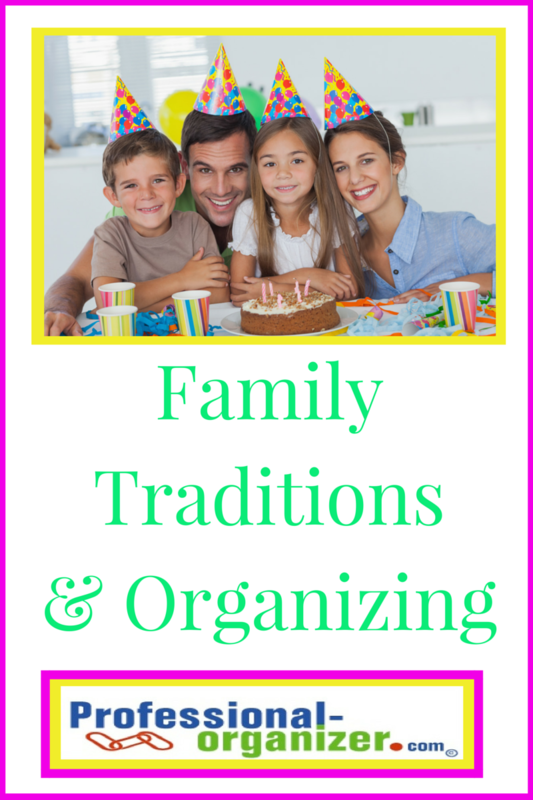 What is most important to me is creating and preserving family traditions. Whether it is sitting down to a family meal together, or having cream puffs every Christmas, this is my priority. Having the “stuff” that connects to the meaning of these traditions makes it easy for me to make decisions on what to keep. I recently decluttered in the kitchen. Letting go of the skewers never came to mind. I did bless others with a soup tureen (wedding gift, never used in 27 years), coffee cups (from my mom, but seldom used), bread baskets (we already have plenty) and extra utensils not used. The skewers are in a seldom used spot, but one I could easily access. Always, I want to encourage you to prioritize what matters most to you. It is vital to how you live your best life, making good decisions about what is around you and how you use your time. Begin by reflecting and creating awareness, then write down your priorities to have clarity throughout the year. Take baby steps to stay on track with this priority whether by letting go and blessing others with things that are not used, or clarifying your commitments. What are your priorities? What are your really important family moments? For some of us, creating routines is natural and comfortable. We love repetition and the sameness of routine. However, some of us like spontaneity and the excitement of new and fresh! Can there be a balance or a way to merge these two ideas? With the challenges of ADHD, often there is a big void of routines. It is unnatural and uncomfortable. However, a few important small routines can make a difference. Start with an awareness of how routines can make a difference for you. If you have ADD or ADHD, think about how whether having one day established for a certain task might be helpful? The time does not have to be rigid, but it should be compelling. I suggest having one hour of administrative time once a week to catch up with tedious, required tasks. Having a routine set for admin time, such as Sunday afternoon between nap and dinner, make certain that paper is acted on. A routine might be something that happens daily or weekly. Laundry days can be every day in the morning or every Monday and Thursday. Add on one simple, small step to an existing routine. If you are already successful at a task, add on a related task as the next step in your routine. It can be simply empty the trash in your car each time you get gas. Toss the junk mail right after you put the kids to bed. Add a partner to get a task finished. You and your kids, spouse, or friend can fold and put away clothes, clean up the kitchen, or file and chat. Give yourself permission and time to do a routine well. If bill paying is the priority, that is all you need to accomplish in one day. It is okay to accomplish one big job in a day. Use a checklist to successfully begin a new routine. Your checklist will prompt you visually with the steps in your routine and you won’t have to rely on working memory. Your checklist will ensure completion too! A checklist can be used at the beginning or end of the day and placed in a spot where you will see it regularly. Don’t give up a routine easily. It takes at least 3 weeks and up to 6 weeks to get a routine established. Have tenacity and a compelling reason to keep your routine going. When I started my work 10 years ago, many of my clients were experiencing the same difficulties in getting organized, especially with paper. It was hard for them to get started, work on their own, and most especially finish up and maintain their organization. It was at that time that I realized the value of my work with clients with ADHD and ADD. Working with clients with ADHD, I work as a partner with them, bringing energy, focus and resources to the mix. Our work starts by narrowing where we will work. Once defined, we work through the area to get to 100% , fitting their degree of order with their lifestyle. As we work, we discuss the maintenance aspects of the space, talking through the how’s, why’s, and more of getting things back into order on a regular basis. 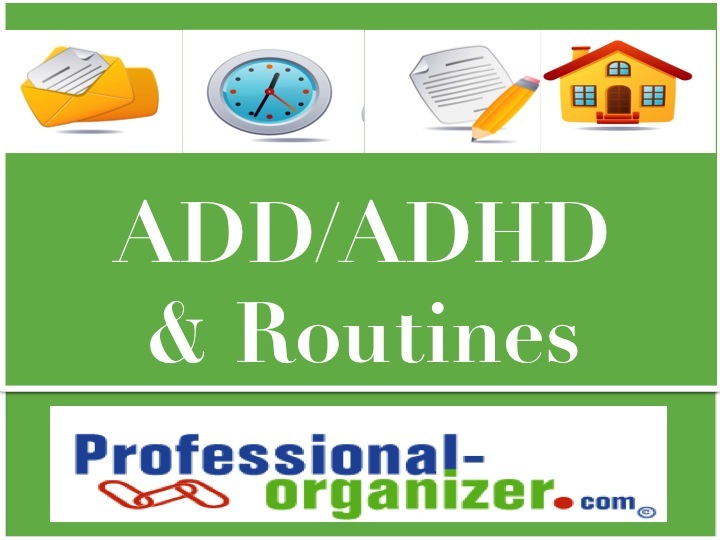 Here are a few tips for ADHD and organizing. Start with a compelling reason with a deadline to get organized. Wanting to be organized is sometimes not enough! Plan a party or invite a guest to stay at your home are scary but huge ways to get you moving! This deadline will make you kick into gear but also keep you on track. If you are a parent, wanting to model organizing, can be equally compelling. Work with a clutter buddy or paper partner, professional organizer or ADD coach. Having a partner makes things happen! You have dates for accountability, fresh ideas flowing, and energy from your partner. Start with a vision of what your space should look and feel like. If you start with the end in mind, you will stay on track and get to your personal finish line. Start small and focus on one step at a time. You are already overwhelmed! Working in one spot makes for success. The hardest part is to keep from “zigzag organizing,” moving from room to room. You start in one spot and just place sticky notes outside the door for the rooms you will be distributing items to or have a basket at the door that will collect item to distribute later. There are challenges for those with ADHD or ADD and organizing. It can be done! I invite your posts on how this could help you get started or get finished on your organizing! It’s that anxious feeling you have when you are running late for an appointment and you can’t find your keys. It’s that sinking feeling of depression while looking around your home, knowing you are overwhelmed by the disorder in different rooms. It’s that stomach ache you have when you know you have to do your taxes, but you can’t find your forms or papers to fill in the amounts. It’s even that “discussion” you had with your husband about dinner or laundry and who is responsible for what at your home. We live in a world of high expectations, where guilt and shame underly our lack of organization. When we want to connect, disorganization is a barrier to having company in our home. Being disorganized causes all kinds of stress, whether it is physical, emotional or psychological. The first step in de-stressing is to take care of yourself. It is usually the last thing we do! Taking care of yourself is assessing whether we had a good night’s sleep, ate a healthy breakfast and gave ourselves enough time to do a task to start with. Take stock of all these aspects, putting your “own oxygen mask on first.” This is the first area to attend to if we are to make a change and de-stress. Make a plan and work your plan. Take stock of what you do well and what you don’t. Work from your strengths and make a plan of what you can get accomplished. List your goals and priorities and see if you are aligning your daily commitments. If not, it’s time to un-calendar some tasks. If you “should” accomplish a task and find it is not a strength, create a team and delegate tasks. Tasks may not be done the way you do it, but it will be done! Write out your plan so you can see it daily, including weekly routines with set days and times for certain tasks and open, untethered days to rejuvenate. Use tools that work for you. In our world of technology, using your smart phone for your calendar and task list can make all the difference. Instead of keeping all the details in your head, get them out onto your calendar and task list so you are working high speed on what you need to accomplish. Disorganization and stress can be remedied with baby steps to change. What ways are you working toward making a change? My motto is “why reinvent the wheel?” There are lots of repetitive tasks and routines we do in our home and office, with our kids and our assistants. Here are some ideas for check lists that make a difference. 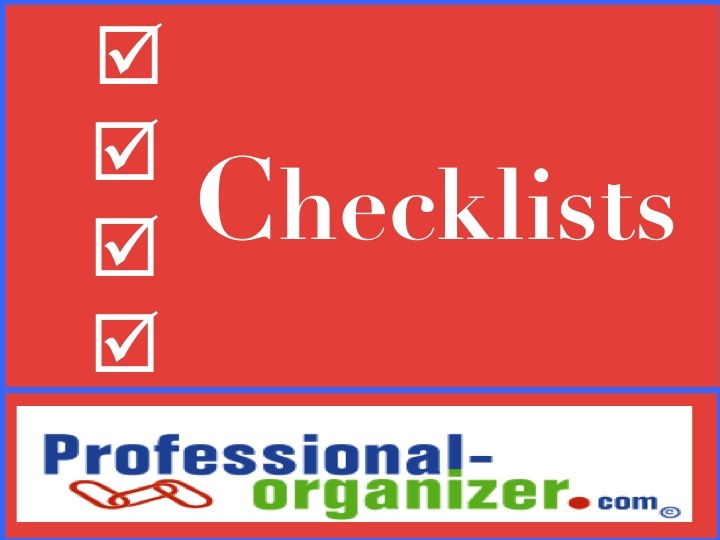 Find lots more free checklists at www.familymanager.com! A plethra of checklists are available at www.listplanit.com!